And there it is, the Kindle Fire. 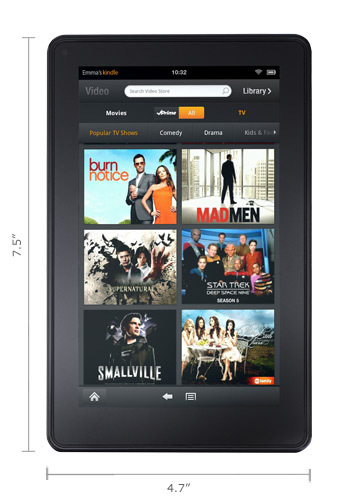 This Amazon tablet has a 7" IPS Display with a dual core processor. It weighs in at 14.6 ounces and a thickness of .45". It has a screen resolution of 1024 x 600 and 8GB of internal storage. It will be released on November 15 and will have free two day shipping. It will come pre-loaded with your Amazon account already registered so you are ready to go out of the box. The Kindle Fire will certainly be the winner for cheap tablets this holiday season. If you are looking for a simple media tablet this looks to be the one to get. Did I mention it was only $199? Sprint iPad on the way alongside iPhone 5? Google releases Music Beta web app for iOS! Evernote for BlackBerry PlayBook now Available!